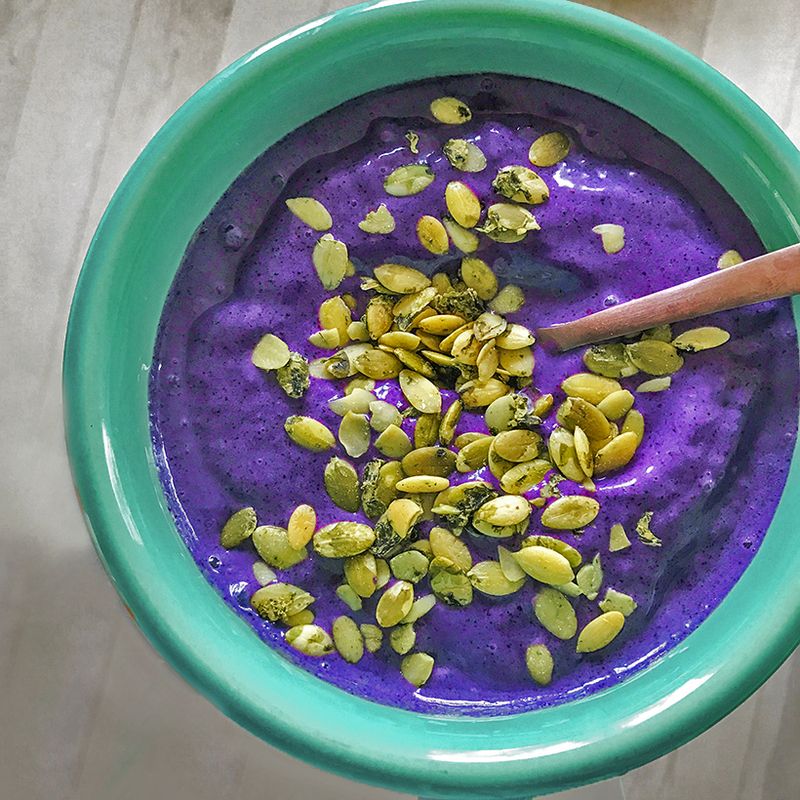 This Wild Blueberry Pumpkin Seed Protein Smoothie has been a favorite of mine for a while now. Simple ingredients and loads of flavor, sweetness, a hint of salt, fiber and healthy fats and even plant-based protein from pumpkin seeds. Here is my recipe and specifics on which pumpkin seeds to use..
Sunshine weekend! So happy to see such gorgeous weather hitting Los Angeles. Of course my allergies are going crazy from the super bloom, but still, I’ll take the clear blue skies, warm and perfectly dry air and fresh ocean breezes any day in exchange for a bit of flower and tree sourced pollen. Season Change. April is usually the month when I start adding a daily smoothie to my diet. And this is probably one of my all time favorites. I started adding pumpkin seeds to my smoothies when I wrote 365 Vegan Smoothies. 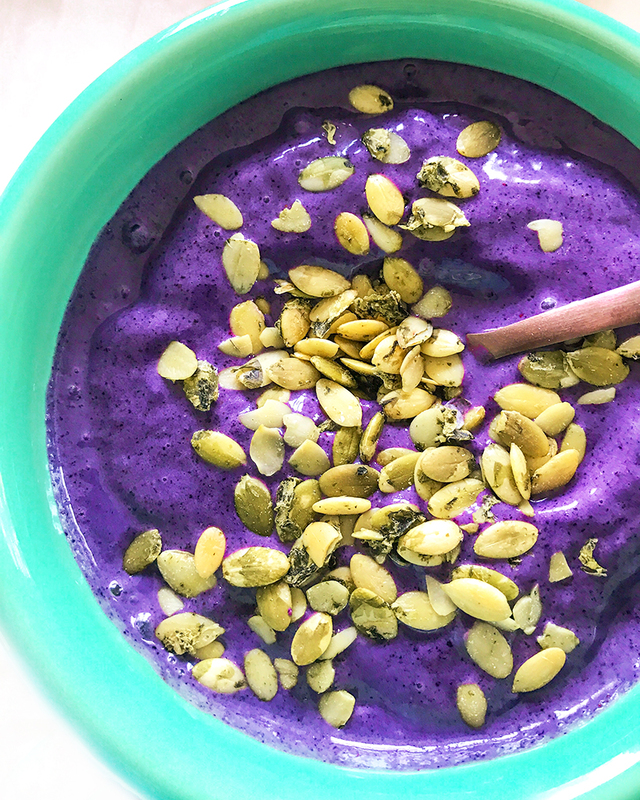 And since then, those salty, crunchy, buttery green specks have been my very favorite topping for smoothies and smoothie bowls. 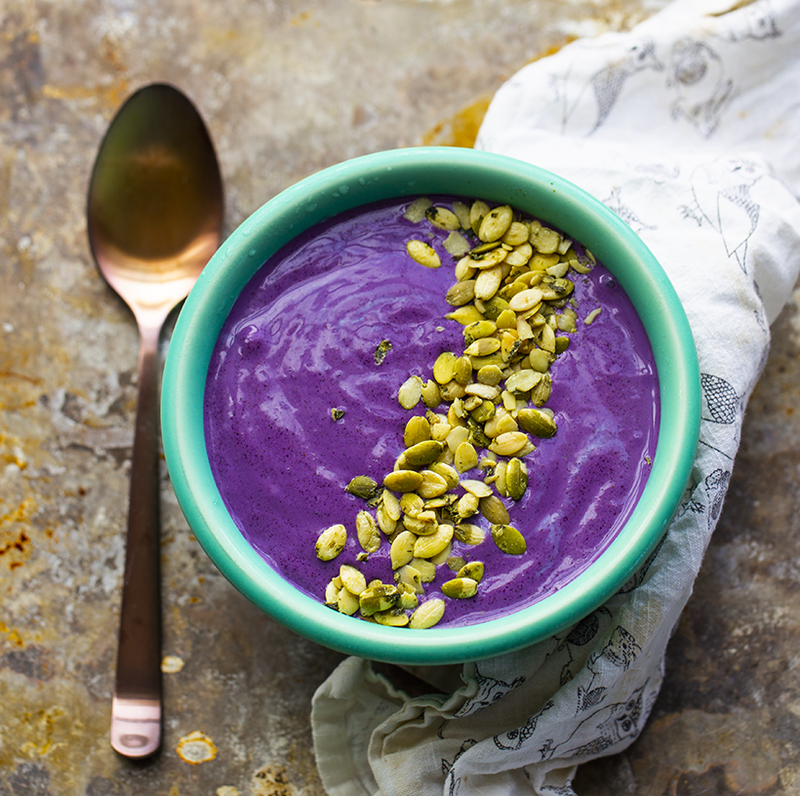 And this antioxidant-rich smoothie has them on top and blended right in. Purple Smoothie. 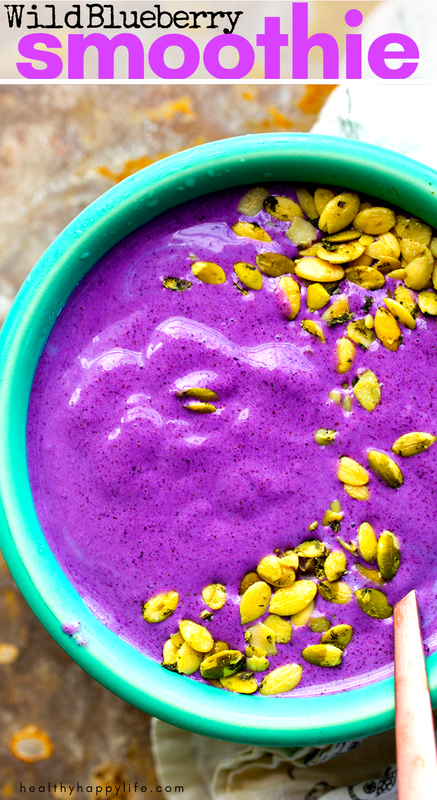 I adore the color of this smoothie. It is just beyond gorgeous. 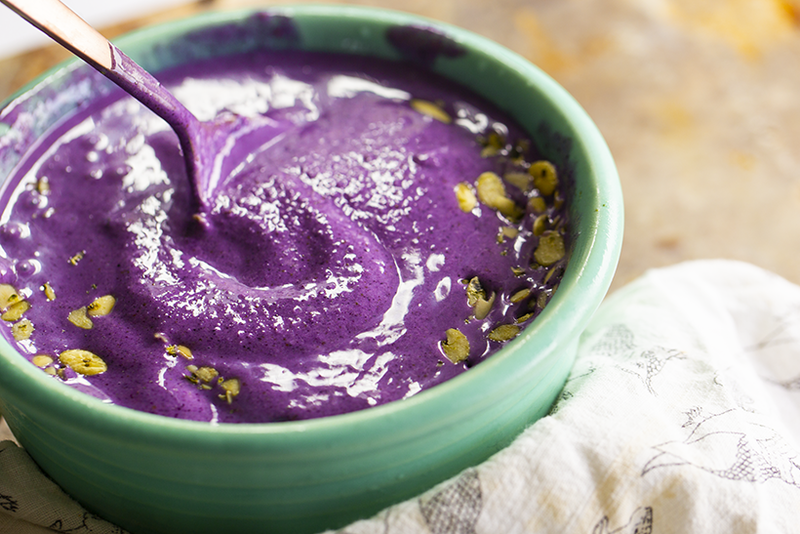 Those wild blueberries create this rich purple color – eye candy in every blend. Then a pop of yellow-green on top and spoon dive in. Wild blueberries have twice the antioxidant capacity as conventional blueberries because of the surface area the have. Since they are smaller, they have more skin. And the skin is where all the goodness lies. Plant-Protein. Pumpkin seeds are one of my favorite sources of vegan protein. 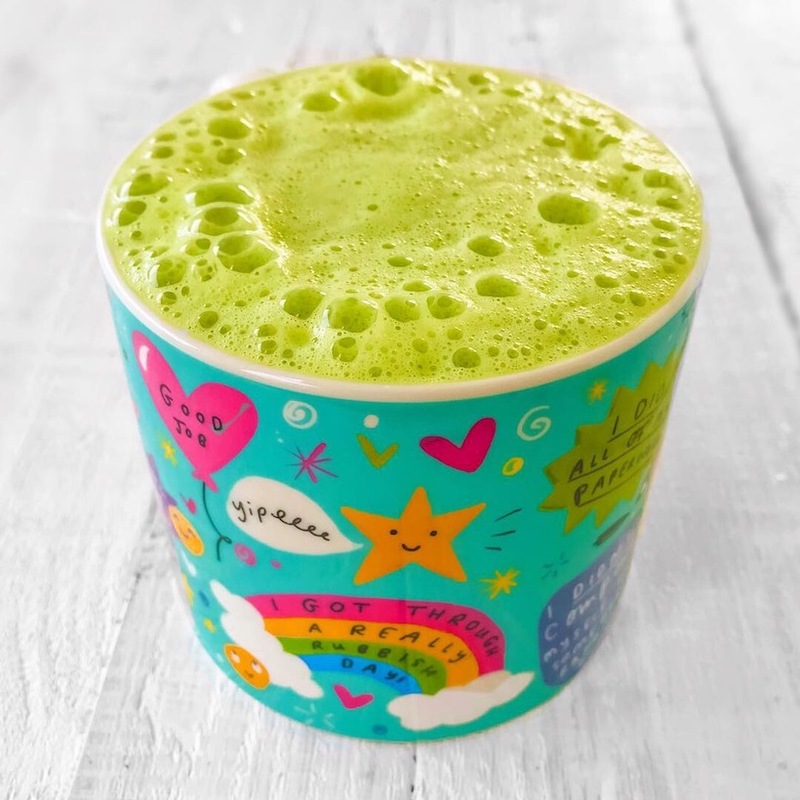 In fact, over the past ten years, you will have noticed a great increase in vegan protein powders that use pumpkin seed protein as a main ingredient. Pumpkin seeds are such a great ingredient for both men and women – they contain protein, zinc, magnesium, iron, fiber and healthy fats. Fifty shades of purple. So many purple hues and always just gorgeous! And if you like a bit of heat, these word well too.. It is possible to use plan, raw pumpkin seeds and add a pinch of salt yourself – or omit it altogether. But I usually use the Go Raw seeds. Protein. To maximize protein, I use soy or pea based milk in my smoothies. 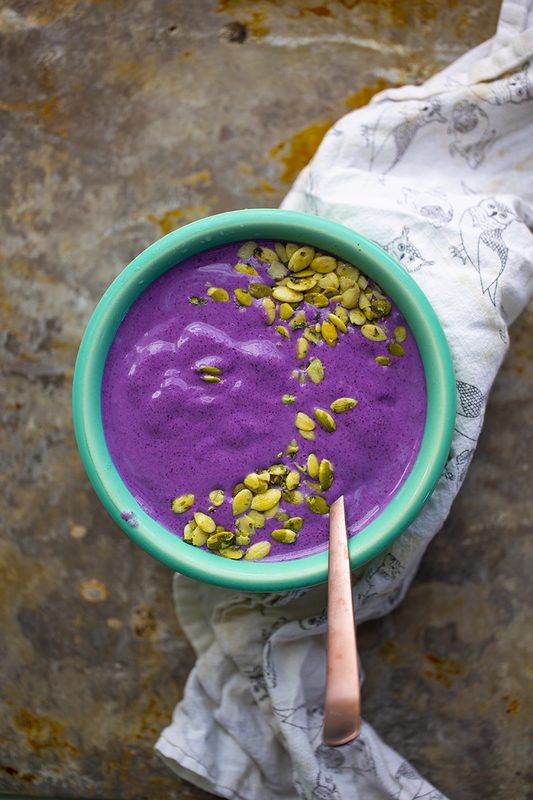 This thick and frosty purple smoothie contains wild blueberries, pumpkin seeds and banana. 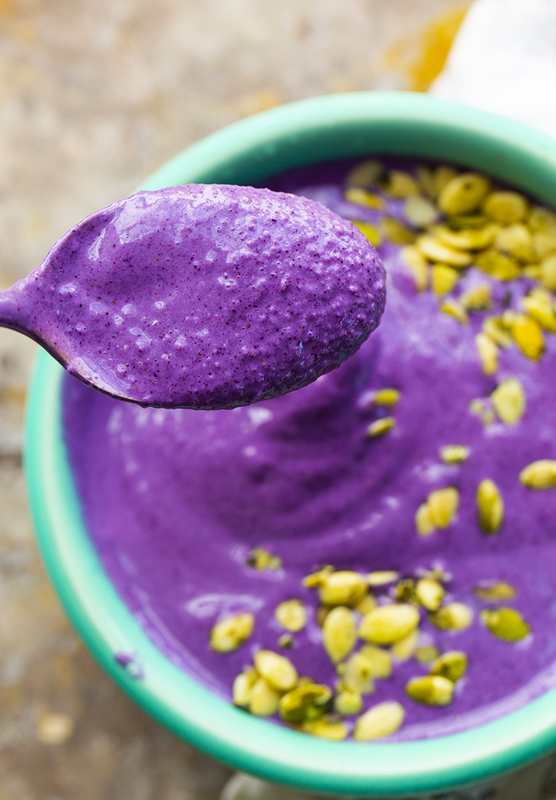 Add the non-dairy milk and pumpkin seeds to a high speed blender. Blend until smooth. Add in the blueberries and banana. Blend until thick and frosty. If needed, add a few additional splashes of non-dairy milk — or a few ice cubes for added frostiness. Pour into a serving cup or bowl and add pumpkin seeds over top to serve.